"a real 4 star airline"
✅ Trip Verified | Milan to New York JFK return in economy. Very solid product, the best way to travel in Y from Europe to US with plenty of legroom, food, film & music with IFE top notch. Even if not the cheapest choice on this route note that flying the A380 worth the premium price because of the superb comfort and silence of the aircraft. Crews are just OK , but they did the right job. EK is a real 4 star airline. Recommended. "airline has gone severely downhill"
✅ Trip Verified | London Gatwick to Kuala Lumpur via Dubai. Terrible service, cabin crew unprofessional and not responding to calls. The airline has gone severely downhill. I haven't travelled with Emirates since 2012, and back then it was fantastic. Good customer service, food drinks and snacks were offered regularly and it was definitely a different experience than travelling with Lufthansa or BA. Now BA offers much better service on long haul flights than Emirates. ✅ Trip Verified | Singapore to Edinburgh via Dubai. Was quite excited for this route but turns out to be a total nightmare and I would much rather stuck with my usual BA. The second leg of the flight from Dubai was delayed by 45 min. Plane was hot for the morning flight and cabin crew was rarely in sight for the entire 8 hours. Rarely had water or beverages offered. It felt like a budget flight. On the return flight ground staff had poor customer service. I wanted to buy an extra bag at the airport but they insisted on charging me overweight which amounted to £500 and resulting me in leaving my belongings in the UK. Inflight service was poor. Again cabin crew are rarely in sight. The second leg the snack was so dry I spat it out. Also not to mention no cabin crew was bringing out water for the flight. Overall an incredible letdown. Never flying this route again and Emirates isn’t worth the hype. "does not get a recommendation"
✅ Trip Verified | Gatwick to Manila via Dubai. Was recommended by a colleague to fly Emirates business class. What I was surprised about was I experienced 2 very different business class products – I was totally shocked at the difference. London to Dubai was on an Airbus and Dubai to Manila a Boeing 777. 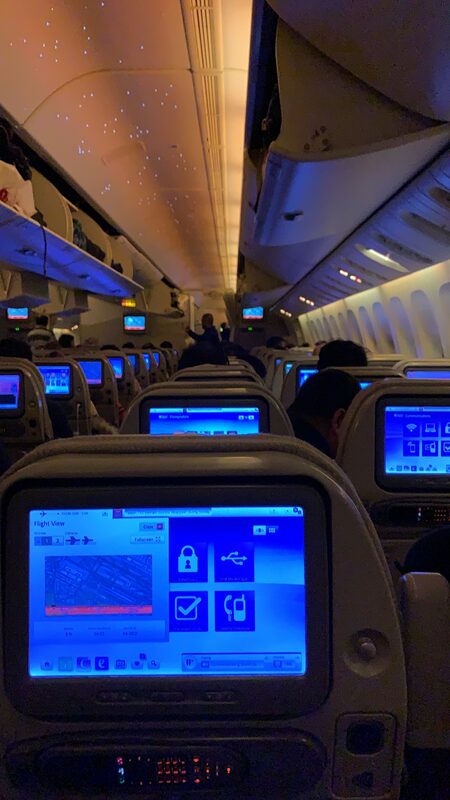 The Airbus flight was aligned to business class travel expectations, seat was reasonably comfortable, large selection of IFE, food was of a good quality. 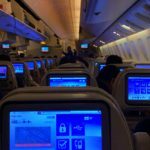 My only quibbles were the seat belt length seemed quite short – it was tight on me and not something I experienced on other airlines; staff helped when asked but otherwise didn’t offer. The Boeing product is significantly inferior – uncomfortable seating and it was not lie flat, no storage at all, 2-3-2 configuration, no amenity kit etc, slow food service with a very limited selection. 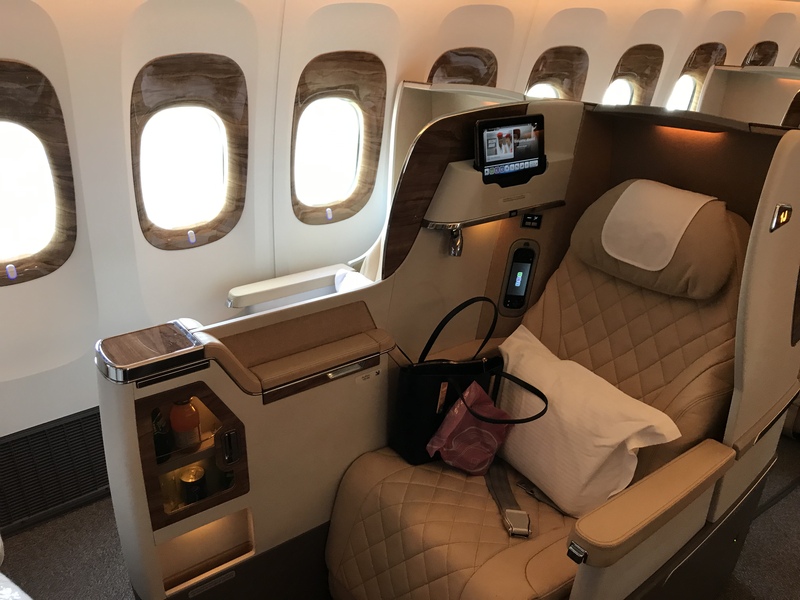 The Boeing flight is like flying premium economy – a good amount of leg room and a wider seat (seat belt size was much longer) but that’s as much as I can positively say about it. 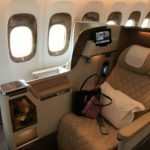 It was a really uncomfortable flight for me given it was close to 9 hours – I felt cheated for having paid for a business class seat. Regrettably, I had 2 more business class flights that week with Emirates which were not refundable otherwise I would have cancelled. Flew HKG to Dubai on an Boeing 777 - just as bad (if not worse) than the Manila flight. What storage existed was used by the cabin staff, myself and 2 other passengers had to store our cabin bags several rows behind us in a single overhead – we had to do this ourselves, no help or interest from cabin staff. Food was awful. Lounge in Dubai served excellent food and beverages and had some nice quiet seating areas. However, if you wanted some F&B getting it was a bit of a challenge - I witnessed only 2 serving stations for main courses and tea/coffee - despite being there for over an hour, never did manage to be able to get through the endless throng to get a cup of tea. I regularly travel long haul for business but I'm afraid Emirates does not get a recommendation from me. ✅ Trip Verified | I bought an economy ticket to Cairo but the service was very poor, is totally different what you see on publicity and advertising spots. The cabin crew were not professional. The plane felt narrow and it was difficult to move or ask permission for the bathroom. The bathroom only one for the entire economy class. The free wifi, was not working for the way DXB to CAI so I was so disappointed really. "seats low quality and grubby"
✅ Trip Verified | Brisbane to Dubai. I always thought Emirates was supposed to be one of the best but let me tell you, it is not. The staff were pretty professional but that is common among airlines. I was initially excited to be flying in an A380 for the first time but the moment I boarded, my heart sunk. It was obvious Emirates had chosen the the cheapest possible configuration that you would expect on a budget domestic airline. The seats were super low quality and grubby. There was next to no padding which made it painful for a 14 hour flight. The air was dry, but worse is the LED lighting which has a low Hz flicker. This becomes migraine inducing as the lighting splits into green blue and red as you move your eyes about. There is also an insufficient number of toilets available. The Boeing 787 is much better from my experiences on other airlines. Overall disappointed. ✅ Trip Verified | Melbourne to Dubai via Singapore. I had a fantastic flight with Emirates, from check-in to arrival. The ground staff were organised and efficiently boarded all passengers. The flight crew ensured I was comfortable and even the odd chat when they weren't busy. One even went out of her way to help me translate something into Arabic. The meals were more than adequate. In-flight Wi-Fi was affordable - $20 for unlimited wi-fi. "the worst flight I ever had with EK"
✅ Trip Verified | Probably the worst flight I ever had with EK since I started flying with them 13 years ago. My route was DXB-CAI and return both ways were with very old outdated B777. First of all EK stopped handing hot towels prior to take off, inflight magazines are removed from the seat pocket probably to reduce cost. On the way DXB-CAI we boarded on time however there was a delay of 1 full hour sitting on board with no explanation. Crew didn’t even bother to serve water or a juice and no explanation from the captain, secondly my headphones were not working properly due to the age of the aircraft and I had to keep holding it. Seat was broken and always reclining however I informed the crew but nothing happened, they kept asking me to adjust my seat to up position and I kept telling them it was broken. On the way back it was the opposite, it wouldn’t recline at all. The food service also has dropped a lot with the quality of the meal service and the portions which have become similar to what you get on a Low cost. When arrived back to Dubai also 30 mins late the luggage was delayed for more than an hour, they announced on the speakers but no explanation which led to being late for my early morning meeting as was supposed to land at 7:10am and had meeting at 9:30 am but I had to cancel it and of course no explanation or visibility of EK staff. I’m seriously trying to avoid using them as much as possible now. Very disappointed with what they have became. "it has been a nightmare"
✅ Trip Verified | Houston to Dubai. We have so much high opinion about Emirates since we had flown 3 years back. But looks like new Emirates is about boasting and less action. Right from the time we checked in to inflight cabin crew to nightmare of changing the flights, it has been a nightmare. When i send a feedback to Emirates, no reply back from them. The cabin crew has no regards to the passenger and they would not even react to the call unless you personally go to their area and ask for water. The customer service was a nightmare. Based on where you call, you get that type of service. If there are other options, i would avoid flying Emirates. Not Verified | Newark to Delhi via Dubai. Prior to flying with Emirates, I flew with all the American and major European airlines in North America, and Europe. I must say Emirates is way better than all, and exceeded my expectation. Seating quality, leg space, TV screen, selection of movies and tv shows, food all are fantastic. As of now, this is the best airline so far. This was the fifth time I was flying with this airline, and I will continue with them. Also, connecting in Dubai airport is easy. Security screening is very fast and convenient. The airport itself is amazing, so if you're flying with Emirates and transiting here in Dubai, you're in great hands!